am i forever doomed to fail at japanese cooking so long as beer and i remain friends? is it only a matter of time until my entire local fire department shows up uninvited to my apartment for a blind dinner date? should i just bandage my maimed fingers and bury the proverbial sushi knife? i may be a pro when it comes to burning things, but i’m not so quick to burn my washoku bridges. because i’ve got an ace up my sleeve. i’ve got nimono. nimono uses exclusively common seasonings (namely soy sauce, rice wine, mirin, and fish broth) plus whatever ingredients you deem appropriate. pick a meat/fish and a few high nutrient veggies, and you are ready to go. if you forget the stove is on while cooking, it actually turns out better. much like slowcooker beef stew and chilli, nimono is stupid drunk poor man-proof. and so i began the search for a nimono recipe i could practice, modify, and add to my repertoire. when i finally found one, it just so happened to hail from the southern island of kyushu. i gathered my ingredients, poured my beer, and steeled my mind for clinical testing. empty glass after empty glass flew by, but despite my best efforts, it turned out unfathomably delicious. slice them veggies. if you managed to get a whole chunk of lotus root, make sure to cut slices so as to preserve the beautiful pin wheel shape of its interior. cut the carrot into thick rounds, then slice each of those rounds into thirds to create beautiful, evenly sized wedges. get out a nice sharp knife and lop those chicken thighs into bite-sized pieces. i like to cut mine a little bigger, but it is totally up to you. add a little bit of oil to a deep pot, bring it to medium high heat, then add the chicken. saute it for a few minutes, then add all veggies except for the peas. saute for a few more minutes, then add the dashi, rice wine, and dried shiitake. give the pot a stir, then turn up the heat. once the contents of the pot reach a strong boil, add the soy sauce and mirin, and cover the pot. reduce the heat as low as possible. the contents should be barely simmering. after one or two minutes, add the chikuwa and konnyaku noodles. make sure they are fully submerged in the broth, then cover the pot once more and allow everything to simmer together. here is the key to excellent chikuzen-ni: kill the heat, remove the lid, and let everything cool. letting the contents cool allows the broth to intensify and the flavors to mix more completely. once everything has reached room temperature, turn the heat back on low and bring everything to a simmer again. replace the lid and continue to simmer for anywhere from fifteen minutes to an hour. while the everything is simmering, break off the stem and remove the strings of the peapods using your hands. put them into a steamer and steam them for just a few minutes. it is very important that you do not overcook the peas. if you do, they will lose their texture and color, both of which are very important to the dish. when everything is ready, add a few pieces of each item to a deep bowl, then ladle a liberal amount of sauce over the top. serve alongside a piping hot bowl of rice and a fresh cup of green tea. savor the flavor of japan. This entry was posted in culture, dinner, japanese food, recipes and tagged Chicken, Easy, Japanese Food, Nimono, Umami. Bookmark the permalink. A delicious dish. When I was younger, I too shared your approach to cooking (drink addled and often falling asleep in the kitchen). With the benefit of time, I have matured somewhat and now don’t have the excuse of being drunk for the culinary disasters I create. Post on, young man, it’s great to read. thanks for the kind words as always, conor. i must admit, this post was partially inspired by your illustrious “easy oriental” series. Trust me, it comes with age. Either that or living in a cardboard box on the side of the road! That looks heavenly. I just spent literally all day catching up on a tremendous amount of cleaning stuff. Matt’s promised to bring food home on his way back from work, however it could be late and I don’t trust him to remember. Suffice to say, I could wolf down 2-3 bowls of that. see, that is the problem with this recipe. in the whole recipe, there is only one type of meat, and it ends up so tender you barely remember it is there. 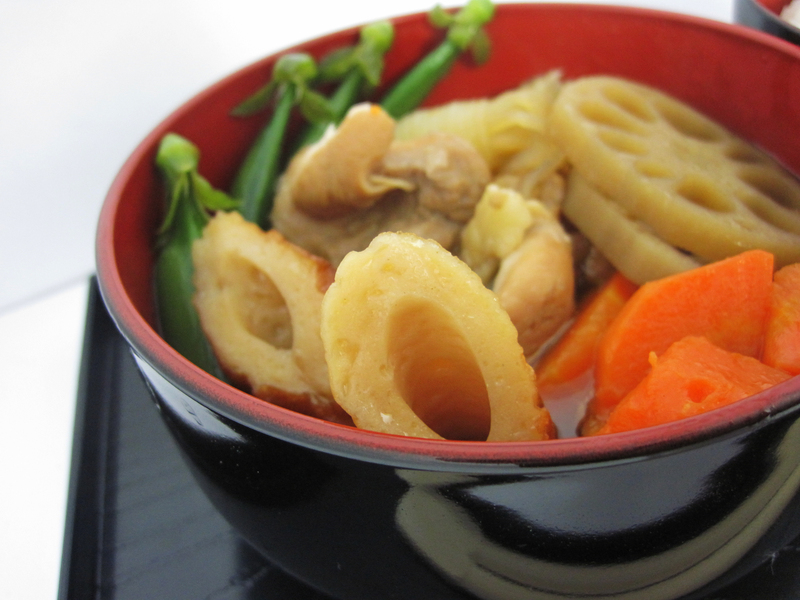 chikuzen-ni is basically just an amazing slow cooked vegetable soup. which means you literally can eat two or three bowls and still come back for more. plus, you don’t feel sick afterwards (which is always a plus).